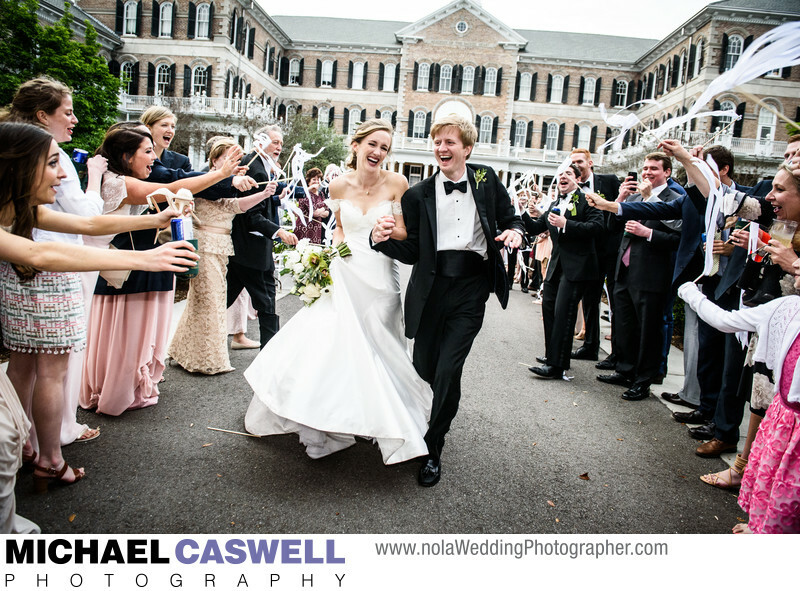 While wedding ceremonies in the chapel of Academy of the Sacred Heart in New Orleans are not uncommon, many people don't realize that Sacred Heart can also host wedding receptions, as was the case with this wedding on a gorgeous spring afternoon. The ceremony had taken place right across the street at St. George's Episcopal Church on St. Charles Avenue, and the reception was held in Sacred Heart Academy's spacious courtyard. There's no denying the pleasing symmetrical architectural beauty of this distinctive building, which was constructed around 1900. A highly regarded Catholic school for girls, I always love when brides who were educated here return to be married in the school's beautiful chapel, and although I've photographed wedding ceremonies at this church in the past, this was my first time shooting a reception at this venue. This particular shot was one of those instances where I know right away I had captured a very memorable and special image. The enthusiastic guests with streamer sticks provided a wonderful send-off for the bride and groom at the end of the event. The energy and excitement of the friends and family was transferred to to the bride and groom as they ran through the streamers, and I love the resulting expressions. And, certainly not any less important, the timing of the departure was absolutely perfect in terms of light, being about twenty minutes before sunset. I'm not sure if this was the intention, but I appreciated it nonetheless! This couple had another unique element to their send-off. Rather than being whisked away by limousine, they instead walked to nearby streetcar stop, boarded, and off they went! While it's not uncommon for a wedding to feature one or more chartered streetcars to carry off the newly married couple with perhaps the bridesmaids, groomsmen, some family members, and some of the guests, that was not the case here, as they did not charter one and just intended to hop onto one at a regular stop. But as as anyone in New Orleans can tell you, while streetcars are supposed to pass about every 15 minutes, it's impossible to predict exactly when one will come. If one happened to pass just before you arrive at the stop, you might be in for a bit of a long wait. Ordinarily this isn't a big deal, but in the context of a grand and festive wedding send-off, it would have been a bit awkward and deflating to have just departed the wedding reception by running through a cheering crowd of guests, and then have to stand right across the street for 10 minutes waiting for a streetcar to arrive. Obviously the preference for such a send-off would be for the couple to be able to hop right on to a waiting streetcar, but unless you have specifically chartered one to arrive at an exact time, there's no way to plan precisely when one will pull up. So, the couple's simple and practical, yet brilliant solution was to enlist the help of one of their friends who was assisting with the coordination of the wedding, who drove several blocks up St. Charles Avenue to wait and watch for an incoming streetcar. When one approached his position, meaning it was a few minutes away from Sacred Heart, he conveyed this information by phone back to another coordinator standing by at the venue, who had already begun rounding up the guests for the send-off, and just had to set it into motion with the bride and groom. The result was a perfectly timed ending, with the couple leaving through the cheering crowd, and a streetcar pulling up to the stop moments later as if right on cue. Location: 4521 St. Charles Avenue, New Orleans LA 70115.